You may not get the latest version, but the repo is constantly updated and easy to manage than to monitor and re-download the same from Eclipse download page and update. 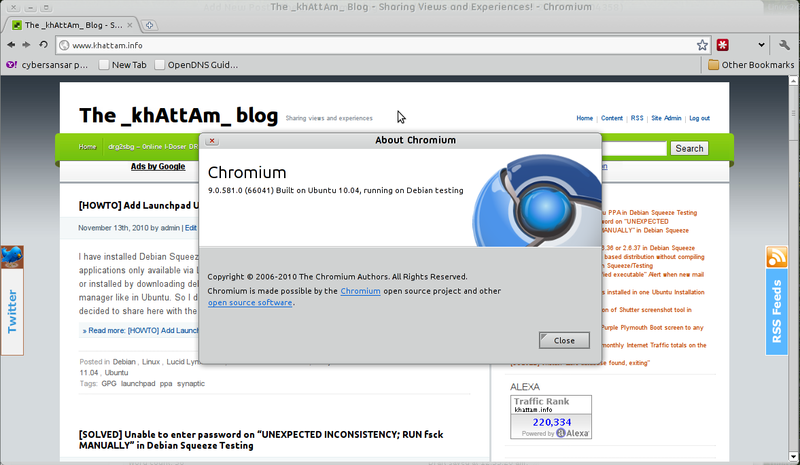 As I mentioned in my previous post, you can install software from Ubuntu Lucid Lynx PPA to Debian Squeeze Testing. 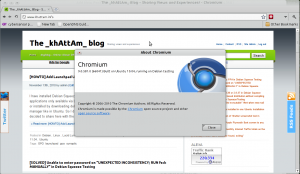 Using the same method, Chromium v9 can be installed in Debian Squeeze using the Ubuntu Chromium Daily PPA. I have installed Debian Squeeze Testing replacing Ubuntu 10.10 Maverick Meerkat and miss some applications only available via Launchpad PPAs. Not that they can’t be compiled from their sources or installed by downloading debs, but it would be great if updates were available from update manager like in Ubuntu. So I decided to add some Ubuntu PPAs and they are working fine. So, I decided to share here with the hope that it would be helpful to my readers. Note: If you are not able to sudo, you may either enable it or use su followed by commands instead. After that, reload the package list and install the package. This may not work for every program that there is but it works for many. Hope this helps. [ad#ad-1] I had moved to Gnote from Tomboy notes in my Ubuntu 10.04 Lucid Lynx Alpha because I wanted to free some space by removing mono (I don’t play gbrainy and I do not have a photo collection in my PC :)). Deluge would just crash and would not show up at all. I tried searching for a solution, but did not find any. I tried upgrading to the ppa version of deluge with no luck. Then I just removed all the .state (not to be mistaken with state directory) files (peers_tab.state, files_tab.state, torrentview.state, tabs.state, dht.state, session.state and any other file containing .state at the end) from /home/MyUserName/.config/deluge and was able to launch deluge again. You should not remove the state directory because you will lose the torrent list if you do. After that, you will be able to launch deluge. It is a good idea to recheck (Right click on a torrent file and select Force Recheck) all torrent files after you do this. [ad#ad-1] I used to connect to PPPoE connections in Kubuntu with knet. Recently, I moved to Ubuntu to find out that Network Manager was unable to connect to DSL. However, it can be achieved using pppoeconf or knet, I wanted to use Network Manager. I figured out that it was a problem with the final release itself when I visited the forums (I had installed Ubuntu Karmic Koala Alpha 4 and then upgraded as new packages came in).